Georgette-Heyer.com - What am I doing here? Listed below are the Romance and Historical novels of Heyer. Select any of the titles to read an extract. Although many of these extracts are favourite parts of mine, others have been entered by ListServ members. 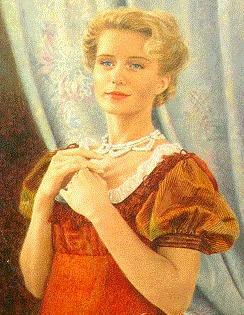 The picture is the cover of both Venetia and Frederica from the Arrow Paperback editions. Although Heyer didn't really write 'series', there are a few books that are linked by common characters. These are These Old Shades with Léonie and Justin parenting Dominic in Devil's Cub and Dominic and Mary are the grand-parents of Barbara in An Infamous Army. While the timelines of the books don't work out in terms of the generations, most of us don't let that small detail get in the way of our enjoyment of the novels. In addition, the characters from Regency Buck are also featured in An Infamous Army. It is probably also of interest to newcomers to Heyer's world that her first novel, The Black Moth was revisited in These Old Shades. As Hodge says in the bio, "Devil Andover from The Black Moth has suffered a sea change into the wicked Duke of Avon (known as Satanas to his friends)." For published date order, please use the bibliography on A Book For All Reasons.